Friends of Oman Group in the European Parliament, headed by H.E. Ramona Nicole Manescu, visited the Special Economic Zone in Duqm (SEZD) on 19-20 December 2017 to see the projects implemented and the investment opportunities available there. H.E. Yahya bin Said Al-Jabri, Chairperson of the Special Economic Zone Authority in Duqm (SEZAD) said that SEZAD offers many facilities to investors pointing out at the same time SEZD geographical location and the local and international status it has achieved since its establishment late 2011. During his meeting with H.E. Ramona Nicole Manescu and the delegation accompanying her, Al-Jabri indicated that SEZD includes a number of diverse investment areas, which offer many options for companies wishing to diversify their investments. For her part, Ramona Nicole Manescu expressed her admiration of the Sultanate's efforts in economic diversification and the growth seen in SEZD in particular. SEZAD provided a visual presentation on SEZD, its geographical location, investment opportunities available in it and the projects under implementation. Oman Oil Company, Oman Dry Dock Company, Duqm Port Company and Wanfang Oman provided visual presentations on their respective projects in SEZD. 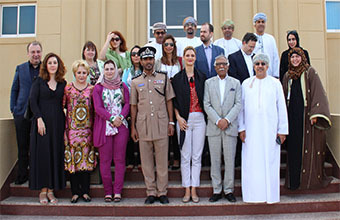 During the visit, Ramona Nicole Manescu and her delegation were briefed on a number of projects in SEZD, such as dry dock for ship repair, Duqm Port, Renaissance Village, Duqm Police Compound, and industrial, tourist, logistic and other areas. The visit of Friends of Oman Group in the European Parliament is part of the Sultanate's efforts to strengthen existing relations and economic cooperation with the European Parliament and exchange views and views on regional and international issues and matters of common concern. H.E. Ramona Nicole Manescu was accompanied by Dr. Badriya bint Ibrahim Al-Shihy, member of State Council, H.E. Amb. Najim bin Sulaiman Al-Abri, Sultanate's Ambassador to the Kingdom of Belgium and to the European Union, and a number of officials from State Council and SEZAD.